Me, windswsept ... in my St Tiggywinkles T-shirt. lol. 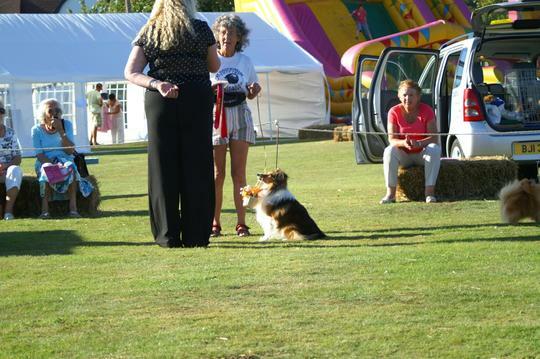 This was a wonderful day I'll always remember ~ the warm evening sunshine glowed on Conker, my Shetland Sheepdog - holding his flower basket, as the lovely lady judge awarded Conker the Best In Show rosette for his gardening tricks routines, which he had enjoyed performing earlier in the day. Conker had entertained the crowd with his favourite gardening equipment, such as raking the grass, pushing his toy lawn mower, and stacking up his flower pots. The judge was unaware that Conker has coped with cancer for the past six months. She made kind comments about his gardening and seemed a very nice person. What a great pic TT, and Congratulations to Conker "applause"... and a Whistle, Nice legs.. Thanks. Dee....yes, Conker does have nice legs..Lol. well done TT and Conker!Congratulations to both of you ~you deserve it after all the trauma you are going through! ~So nice to have a judge who was kind and compassionate~I have watched Crufts on occasion and thought some of the judges really stiff and some of their choices weird! Very well done Conker a lovely rosette for you and yes ..... wolfwhistle TT ! Thank you, Sandra, Bornagain and Louise..
Conker sometimes enters the dog show class for Best Six Legs .... Lol. Congratulations to Conker he certainly deserved his Rosette hope there are lots more to come! A picture and memory to cherish Terra, x gone on my favourites. Lol. thanks, Janey... Truffle reckons he has good legs...Lol. Well done to both of you :)) Conker is still performing in this shot ! Lovely photo TT,well done to Conker on his win ,bless, is this the photo I was looking for yesterday? Bonsai the Welsh Terrier also used to win Best Six Legs Lol. He had good legs. Lol. Conker at his best..well done .looks if he is waiting for a special treat.. I have no doubt Truffle will also win Best Six Legs! When he can stand still long enough...! Truffle is just a bit too lively for some of these dog show classes. Lol. It's great to see some good news in a world often full of unpleasantness. Well done both & congratulations! Truffle thinks the idea of dog shows is that Conker does all the work and Truffle eats all the winnings. Lol. Wonderful. Great to know that Conker is still impressing the judges. Unfortunately I do have one complaint. In future please keep your legs to yourself as they are a real distraction. I can feerl another cold shower coming on. Wonderful. Great to know that Conker is still impressing the judges. Unfortunately I do have one complaint. In future please keep your legs to yourself as they are a real distraction. I can feel another cold shower coming on. Hi Toto ~ I'll ask Conker to keep his legs to himself... Lol... twice...Lol. As you like TT but I know that you know to whom I was referring. Lovely photo TT and yes I admire your legs as well, lovely to see Conker doing so well, congratulations to him. Great to see what you look like, very glamorous I must say. Toto liked your legs that much TT, He had to say it twice lol..
Too busy admiring TT's legs to notice the T shirt, very nice though. Lol. Dee... two showers for Toto..Lol. Hi Bob...Conker is getting quite dismayed... he is sure that when we compete in Best 6 Legs. it is his 4 legs which keep us winning...Lol. Hahahaha this thread is gett'n funnier..
Lovely photo, TT! So pleased to hear that Conker has won a rosette & dog food at the show. My best wishes for you both at the vets on Wednesday. I really hope the swelling in his face is caused by an infection not a reappearance of his cancer. Hello again Dee... glad you mentioned the T shirt... Lol. maybe a little honey licked off your fingers would help ? Lovely to hear that Conker is feeling a lot better now and is performing again. Our hedgehogs come to the garden every night. They are all looking well. I switch on the kitchen light and go into the darkened conservatory to watch them. They certainly like peanuts and sunflower seeds. Hello Linda ... yes, Conker is enjoying performing again. In fact he has a furry hedgehog in with his gardening tricks..Lol. Lovely to see Conker performing and winning! Great pic! Whats on the t-shirt?? I was invited to visit them to present the cheque... the little garden was amazing... full of rescued deer, hedgehogs, birds etc, waiting to be returned to the wild when in full health.... this worthwhile charity so deserved larger premises. Les Stocker whizzed through the kitchen on his way out to rescue a swan, and paused to kindly sign my copy of his wildlife rescue book..
~just been to the Tiggywinkles site and it sounds as though they already have 500 small hedghogs and each one costs £111 pounds to overwinter so they are asking for funds~they take paypal etc if anyone wants to help! That's strange... the top photo number has just changed ! Lol. YeeHaw!!! Yip-Yip-Yip...YeeeeHaw!! !..Look at you two! .Good job conker!..Tail wags and waves and xxxx's and hugs! You both are looking great! Conker is my hero! What a Great furkid he is! Congratulations to all the 'legs' for winning. Sounds like a great day out. Good luck for tomorrow, fingers crossed and tails wagging (well, not mine, but Chloe, Poppy and the terrible trio are doing their best). A lovely happy pic of you both Terra, Conker is so proud to be sitting there. Hugs for him and you for tomorrow. Well done Conker. A real STAR!!!! Altho' p'raps you could consider a visit to Conker's hairdresser on the way home!!! He looks so well groomed and not at all windswept!!! Funny you should write that... a few minutes ago I phoned to book my annual haircut... Lol. ! nice one terra keep up the good work lovel conker.good luck to you both in the future.lol.kev. Just seeing this for the first time, TT.. I suggested that "mom" should show up in a photo too! Congrats to Conker on another award, and to Truffle on taking a lovely pic! ....and I'm certainly not short Lol. Conker IS looking well Terra...lovely coat. Truffle got the shot just right! Those other dogs didn't stand a chance against "our" Conker. I feel like he belongs to all of us. Aw, yes, Truffle you too. Truffle is now very adept with that camera...Lol. Thanks for comments.... I've sent you a p.m. about the shows... don't miss the bit about Truffle nearly falling off the judging table, and knocking the judge's "JUDGE" rosette onto the grass... Lol. Got it ! The bit about the judges rosette hitting the deck is tooo funny ! Lol Well done all !! Haha Truffles, you're only a puppy once, just go ahead and be cute all you want! Just been to south wales on holiday and saw some hedgehog houses, so Gerry is going to make me one for the bottom of the garden. The judge is the lovely tall lady with the beautiful blonde curly hair. She was very well liked by everyone at the dog show and fete. We had sunshine sunshine sunshine. Saw red kites and buzzards hares and plenty of sheep but no dragons flying around although I did bring a mini red one home to nest. Wow, wonderful Welsh sunshine ! that nesting dragon could produce babies and you'll have little red dragonettes everywhere. Lol. I've created a poem that I am going to work on, but a red dragon would be different woudn't it. A little winter time task for you...Lol. Gerry says he's married to a dragon with red hair, but don't believe it for one minute. I may be fiery sometimes but I don't breathe fire!!!! HE HE HE! I've made a start on another Twinkle adventure for the third booklet. It involves the little red dragon. Lindak, I hope you will post it on GoY when it is done! I can't Weeds as I am selling them for the Cats Protection League at Dalberry Lees. I might post the story of Wriggle the caterpillar up though. Well done Weeds I'm sure they love them. It's so costly to get them into print properly these days and there are so many people writing, although I have got lots of poems in books. but don't get payment for it. At least people are reading them. We make up books at home and give the whole of the money made to charity to help them whatever the cause. It's a matter of enjoying what you do. Gerry reckons that Wriggle the Caterpillar will be too big for the blog but I am putting together film with the story for youtube so will keep you posted. We did indeed, thanks - see first blog!! I have enough photos tucked away for another couple, too! I have one particular charity dog show plant stall pic. from last week, which I plan to put on GoY as a photo. VERY tempting, then! :-) Now that raises the question - do most dog owners enjoy gardening? Or are the stalls there for the spectators? lol. After dog shows, I travel home in my friend's car ~ with my two dogs and lots of show gear.... so the only place for any plants purchased is on my lap. Lol. Your photos are terrific! Pets and flowers/and the added bonus of children, nothing like 'em. Yes, here is the pic I saw, it was probably the same show!! Different show...same shorts, same legs, same dog..:o) Lol. Lol TT - mind you, if I had your legs I would be wearing those shorts too! !